It’s been a just over a year since Studio338 closed its doors after being badly damaged by fire. Now, after major restoration, the east London venue has announced its return. Studio338 will celebrate with a weekend of parties starting tonight. Studio 338’s multi-million pound rebuild includes a new Void Acoustics sound system and a rubberised dance floor. The terrace space has been rebuilt “almost entirely from airport-grade glass and steel columns”, while the striking Octopus lighting installation is a world-first and likely to be a talking point. Rather than just recreating the same club, Dan Perrin and the rest of the Studio 338 team opted to make some substantial improvements for the audience and the venue’s neighbours by installing a sealed glass ceiling to drastically reduce the amount of sound escaping from the club, and future-proofs the venue against further residential developments in and around Studio 338. We’re back for the second season at Printworks, London’s huge 6,000-capacity music and culture space. The massive industrial complex is just a short walk from Canada Water station and easily found with Printworks staff positioned at regular intervals to offer directions. The Printworks interior has deliberately been left as raw as possible, staying true to its original, industrial roots as home to Western Europe’s largest printing facility. Some of the large printing presses remain, making this a truly unique clubbing space. Despite its industrial feel, the space is immaculate and features some of the best sound and lighting in the UK. With six separate event spaces, all types of entertainment and cultural activities are hosted here, including art shows, classical concerts, dining events and gigs. Room 2, also known as ‘Charge Bay’, has a four-point Air Motion system, together with Stasys 4 fills and 218 low frequency enclosures. Monitor duties are covered by Air Streams and Stasys 218s that were installed by Twisted Audio. Void sound systems can also be found in many of the bars throughout the venue, including the Artist Bar. This season’s gigs boast major acts such as Richie Hawtin, The Chemical Brothers, Maceo Plex, Andy C, Claptone and many more.lex, Andy C, Claptone and many more. „Void: How long have you been a Void distributor? EI: We have been working together with Void Acoustics for seven years now, and are proud to have been a part of making the brand one of the most demanded products when it comes to sound. This involved close cooperation with Void’s R&D Team, who are always open-minded and supportive when it comes to adapting products for our market here in Germany. Void: What region do you cover? EI: As an exclusive distributor, we’re responsible for all of Germany. Void: Do you have a favourite Void Acoustics product? EI: That’s a tough question! For us, the Air Motion which became symbolic for the legendary Void look, still is our top choice when it comes to sound and design for up to a certain amount of people. For our rental partners in Germany, the Air Vantage has proven itself because of it’s easy handling, sound and looks. One of our best working setups and favourite combinations are Air Motions or Air Vantages, combined with the Stasys X V2/Xair. Void: What are your most noteworthy recent installations? EI: The most notable installation this year is Blitz Club in Munich. It’s amazing to see and hear the final results and feedback of this project. Besides that, we can look back on a wide range of installations and projects all over Germany, from scene restaurants and hotels, to bars and clubs. Void: You’ve had a very busy festival season this summer, any particularly great ones you’d like to tell us about? EI: Most of the big festivals in Germany this year had Void systems involved, and we had very successful co-operations with Warsteiner and Smirnoff. Parookaville definitely deserves a mention here, but the highlight in this festival season was Docklands Festival, where four stages were equipped with Void Acoustics sound systems. Having Stephan Bodzin close the stage with the new Arcline 8 line array was a really cool experience. Void: Do the festival activations often involve many of the Void Acoustics rental houses in Germany? EI: As we don’t do rentals ourselves, we built up a great network of Void rental partners here in Germany, and the demand for Void Systems from both big festivals and small club promoters increases more and more. We feel that 2017 was an important season for us and the brand in Germany. The Jardin Residence in Ulaanbaatar has opened a restaurant at their ‘Art of Living’ residence concept, aiming to bring the best quality products from around the world to Mongolia’s capital city. 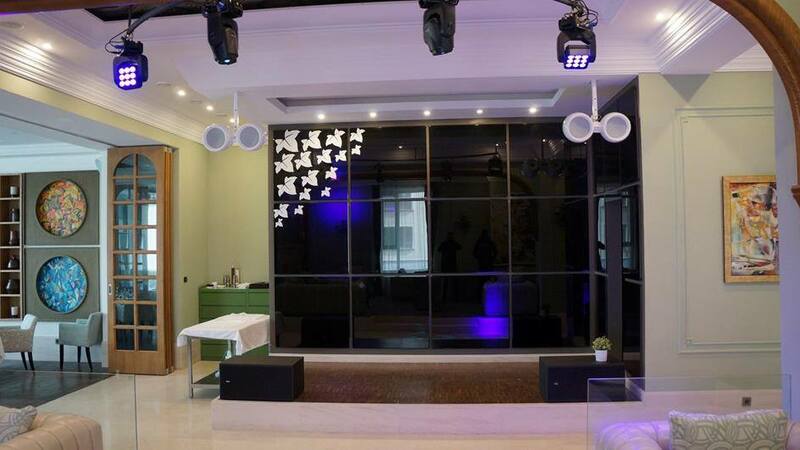 Our distributor in Mongolia, UB Stage Tuning, has already had incredible success in the club and nightlife scene, the Ivy Restaurant is now their second restaurant installation in Ulaanbaatar. Chinbold Bayarsaikhan, CEO and Founder of UB Stage Tuning, acknowledges The Ivy as “one of the most luxurious restaurants in Ulaanbaatar”. Originally positioned right next to Zü Club, relocating to the Jardin Residence now puts this venue in the equivalent to the ‘Mongolian Beverly Hills’.